It’s my own fault. Some years ago, the good people of ______, in their wisdom, elected the village idiot to the Senate. [As Senate Majority Leader] I had to find a spot for him. I couldn’t put him on a committee that deals with things that make a difference in peoples lives. But he liked to talk about foreign countries. So I put him on the Foreign Relations Committee where he could make lots of fancy speeches without doing any harm. I don’t know whether President Trump is as shrewd as LBJ, but I have wondered whether similar thinking caused him to put Jared Kushner in charge of the Middle East “peace process.” Kushner is married to Trump’s daughter and he put in loyal service during the presidential campaign. So Trump had to give him an important sounding portfolio. Why not the peace process, that hardy perennial of futility. (Trump also assigned Kushner to head the White House Office of American Innovation which is supposed to fix the government. To me, that’s the domestic equivalent of bringing peace to the Middle East). At Power Line, we’ve been combating this bit of conventional wisdom for 15 years. We may finally be at the point that Kushner’s utterance is too shopworn to constitute conventional wisdom. I was hoping only John Kerry still believes it. What are the main barriers to stability in the Middle East? One, surely, is the conflict between Sunnis and Shiites. Another, related to the first, is Iranian aggression and ambition. Neither barrier has anything to do with the dispute between Palestinians and Israelis. Can Kushner possibly believe that the creation of a Palestinian state would heal sectarian strife among Muslims or cause Iran to give up its imperial design or its quest for nuclear weapons? Apparently so. He told the Brookings audience that these issues can best be addressed after the distraction of the Israeli-Palestinian dispute is resolved. This is either snake oil salesmanship or naivety in the extreme. The Israeli-Palestinian dispute isn’t distracting many other than Kushner and think tank denizens. Iran, Saudi Arabia, Egypt, and every other player in the Middle East are focused exclusively on their national interests, not those of the Palestinians. Moreover, as Joel Pollak points out at Breitbart, Kushner’s claim that we have to resolve the Israeli-Palestinian issue before the U.S. can improve regional stability is at odds with President Trump’s approach (seemingly successful so far) of forging alliances among regional states and helping Israel forge better relationships with them, outside of any framework for addressing the Palestinian question. As Lyndon Johnson would say, the disconnect is Trump’s own fault. Economics and demographics no doubt contribute to instability in the Middle East. Creating a Palestinian state won’t alter the economics or demographics of the region as a whole. The existence of horrible regimes in Middle Eastern states is a big contributor to instability. Creating a Palestinian state won’t cause regime change. In all likelihood, it will just bring into existence another state with a horrible regime — this one on Israel’s doorstep. Why did Kushner articulate his shallow thoughts on the Middle East at the Brookings Institution? Maybe because this is one of the few remaining outposts that subscribe to them. Maybe because he desires approval from left. [Your] team has in it an entrepreneurial real estate lawyer, a bankruptcy lawyer — I don’t know how you’ve lasted eight months in this lineup. . . . It’s impressive that it’s still going. There’s not a Mideast ­‘macher’ [mover and shaker] in this group. How do you operate with, with all due respect, a bunch of Orthodox Jews who have no idea about anything? What are you guys doing? Seriously, I don’t understand this. I don’t understand it either, but for different reasons. Saban is, if anything, even more, clueless than Kushner. He seems to think the problem with Kushner’s effort is the absence of a “Mideast macher” from the team. But the movers and shakers have been at this for decades. They have accomplished next to nothing. It isn’t the absence of Dennis Ross that makes Kushner’s mission an exercise in futility. But Dennis Ross might be very comfortable with Kushner’s dated thinking. So why has he now confessed to making false statements to the FBI? It is notable that Mueller and company have apparently dropped their investigation of Gen. Flynn’s son, and the plea agreement will dramatically reduce the family’s legal expenses. I believe Flynn has said that he has spent $1 million on lawyers and felt compelled to plead guilty to something lest he is ruined financially. “It wasn’t until after they were already in (Flynn’s) office that he realized he was being formally interviewed. He didn’t have an attorney with him,” they added. Comey was lecturing us about the FBI’s professionalism and integrity just today. Pathetic. This looks like a sleazy, deliberate trap. There is no doubt that under the leadership of Robert Mueller and James Comey, the FBI became a sleazy, partisan operation. A thorough house-cleaning is needed, although it will come too late to do Michael Flynn any good. 3) I would like to see the transcript of the interview of Michael Flynn by Democratic Party activist Peter Strzok and his colleague that gave rise to Flynn’s guilty plea. What, exactly, did Strzok ask Flynn, and how, exactly, did Flynn respond? Is there actually any clear-cut falsehood in the transcript? I wonder. Maybe Flynn really did try to mislead the FBI, for reasons that seem inexplicable. Or maybe he was an innocent man, crushed by the overwhelming power and financial resources of the Democratic Party, represented here by the FBI and Robert Mueller and his team of activists. If I could see the transcript of his interrogation, I would tell you which of those scenarios I think is closer to the truth. (John Hinderaker)Today the U.S. Supreme Court gave the Trump administration a major victory, staying the orders of two lower courts that enjoined enforcement of the president’s revised travel ban. This means that the orders can be enforced, and travel from the affected countries can be banned or limited, while the courts continue to process appeals in the two cases. You can read the Court’s two orders here and here. They were issued on 7-2 votes, with Justices Sotomayor and Ginsburg dissenting in both cases. When a court addresses requests for preliminary relief like those at issue here, a key issue is the court’s assessment of which party is likely to ultimately prevail on the merits. The Court’s two orders today strongly suggest that a solid majority of the Court thinks the president’s travel ban order will prove to be valid and enforceable. In my opinion, that conclusion is rather obviously correct. (Steven Hayward)I’m sure most of our readers will know the old laugh line that “real socialism has never been tried.” Guess what? The World Socialists actually believe this! Below is a chart they’ve put out putting us all in our places (and putting people in their places is what socialism is all about, no?). 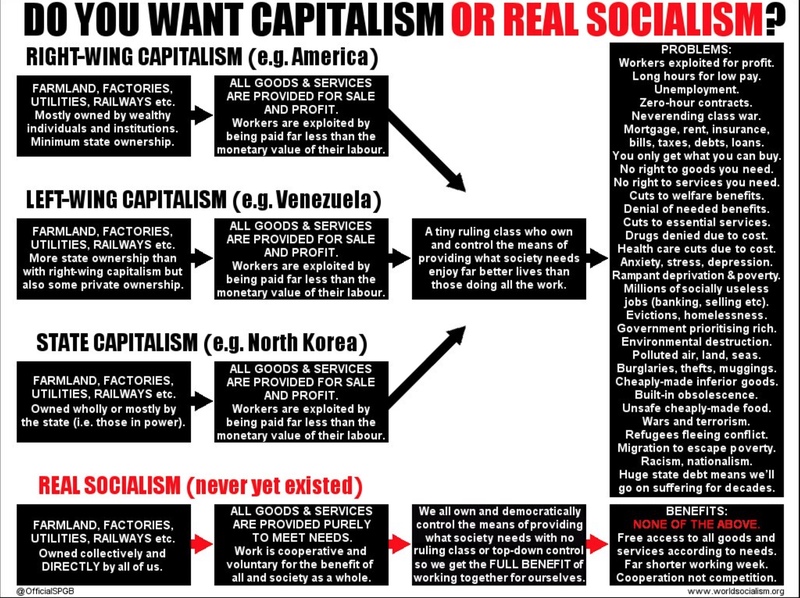 Notice how both North Korea and Venezuela are both “capitalist” countries. Best laugh I’ve had since the latest Kurt Eichenwald tweet. One thing I never get over with contemporary socialist propaganda is how terrible their design sense is: they always cram too much information on a page, as thought, we’ll all be simply overwhelmed by the sheer wordiness of it. Yes, yes, I’ve pondered the possibility that this is satire, but with lefties who can tell any more. I think what we’re beginning to see is the putting together of a case of obstruction of justice. I think we see this in the four indictments and pleas that have just taken place. . . . I see it most importantly in what happened with the firing of Director Comey, and it is my belief that that is directly because he did not agree to lift the cloud of the Russia investigation. That’s obstruction of justice. I agree with Feinstein, and with Andy McCarthy, that this is now an obstruction of justice investigation. I don’t agree that firing Comey because “he did not agree to lift the cloud of the Russian investigation” is obstruction of justice. Trump says he fired Comey because he wouldn’t say publicly what he told the president privately, namely that there is no evidence of collusion. I’m not a criminal lawyer, but I don’t think an obstruction of justice case can be built around a PR issue like this. The real concern would arise if Trump tried to obstruct the FBI’s work as it investigated Michael Flynn and issues related to contacts with Russia. In my opinion, firing Comey because he wouldn’t say publicly what he told Trump privately didn’t obstruct the FBI’s investigation and could not reasonably have been intended to accomplish this. Again, I’m not a criminal lawyer, but this plea on behalf of Flynn doesn’t seem like obstruction of justice. It’s not a directive. Indeed, Comey himself must not have considered the statement obstruction of justice in itself. He reported no crime. Presumably, a case of obstruction of justice would view the plea for Flynn and the firing Comey, taken together, as an attempt to obstruct. But the record doesn’t seem to support the view that Trump fired Comey for not letting Flynn (or the investigation) “go.” The firing occurred long after Comey rejected Trump’s plea. As noted, it appears to have been motivated by Comey’s unwillingness to relieve pressure on the White House by saying publicly what he told Trump privately. The firing of Comey did not mean relief for Flynn or an end to the Russia investigation, nor could Trump reasonably have calculated that this would be the effect. This discussion encompasses only facts that are publicly known. Mueller’s team may know of other facts or allegations. It may be getting them from witnesses it has “flipped.” Thus, Mueller may be able to weave a better case of obstruction of justice than the one I’ve described. But let’s assume the firing of Comey is the centerpiece of an obstruction case. Andy McCarthy argues that because “as president, Trump had incontestable power to exercise prosecutorial discretion and to fire the FBI director,” there can be no obstruction case against Trump. Indeed, says Andy, there can be no obstruction case even if Trump knew Flynn had lied to the FBI (i.e., that Flynn had committed at least one felony), and he leaned on Comey to close the FBI’s probe. McCarthy may be right, but does Mueller agree? What if he charges Trump with obstruction of justice? McCarthy says Trump would have “unfettered discretion to fire Mueller and to direct the Justice Department to drop the case.” The remedy would be impeachment. Again, this may well be right. But if Mueller’s goal is (or becomes) seeing Trump impeached, he might better be able to advance that objective by attempting to prosecute. It depends on the strength of the case he would present in his report. Suppose the case revolves around Trump’s plea to Comey and the firing several months later. The public has known about this evidence for half a year. There’s little indication that a critical mass thinks it warrants impeachment. A legalistic report from Mueller is unlikely to change this. But suppose Trump has fired Mueller for bringing a criminal case. Now you have (1) the rough equivalent of a “Saturday Night Massacre” and (2) something that, in the public mind, may smack of real obstruction. The case for impeachment may gain wider acceptance. In any event, we do seem to have reached a turning point in the Mueller investigation. The collusion probe may be mostly over and the obstruction probe will likely move to the forefront, with impeachment the probable end game.